Is it just me, or is this picture funny? Angie didn’t think it was that funny. Apparently, McDonalds are now serving Blood Shakes. 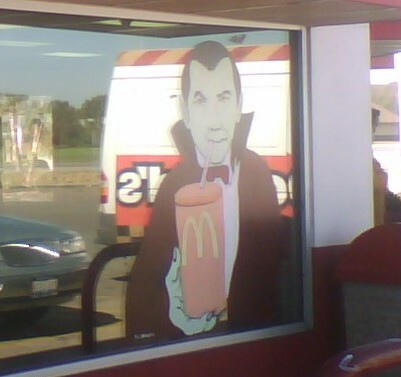 Because, I don’t remember dracula ever feasting on anything besides blood. Or maybe they just don’t show those scenes in the movies. For all I know, he could be addicted to fast food just as much as he his human blood. Anyway, last night we spent last night watching a Halloween special on Cartoon Network. 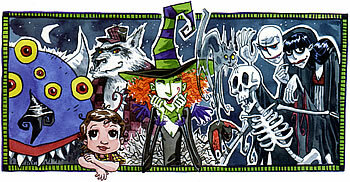 It was called Scary Godmother. There was 2 episodes. The thing that cracked me up was a skeleton named Skully Pettibone. He was Scary Godmothers broommate. He came out of a closet (literally), he made a quiche, and was very effeminate. If you get a chance, check it out, you’ll see what I mean. I liked the Scary Godmother Cartoons last night… it’s coming back on at the end of the month so I’m going to Tivo it for Owen. Greg, that Dracula picture on the window is such a throwback to the ’80s. Did you try the shake? I wonder what flavor it is?